Web analytics and metrics can be overwhelming. The key to avoid drowning in the sea of numbers is to start with six key metrics for measuring how your website is doing. In a previous post, I talked about the 10 best tools for tracking online analytics data for your business. If you’ve started to use any of those tools—in particular Google Analytics—the amount of data they can provide can be overwhelming. When you log in to Google Analytics, you’re faced with a sea of numbers, charts, and menu items. It can be downright intimidating to anyone but a seasoned analytics professional. But, it doesn’t have to be as overwhelming as it looks. If you are new to web analytics, the key is to start with tracking some basic numbers. Once you get a handle on these key metrics, you can expand your data portfolio and build your expertise. Specifically, I like to focus initially on unique visitors. This is the number of people that visited your site during a specific timeframe (e.g., yesterday, last week, last month). Unique visitors represents the count of individual people that visited your site regardless of the number of times they visited your site. So, if person A visits your site once and person B visits your site five times, you will have two unique visitors and six total visits. These numbers are important because they represent the size of the audience that you are reaching. As you expand your marketing efforts, you will want to see if they are effective. This is especially true if you do offline marketing that can’t get tracked explicitly in Google Analytics. So, if you run a magazine ad in the October issue and don’t see a corresponding jump in visitors during that month, perhaps that portion of your marketing budget could be better spent somewhere else. As you get a handle on tracking unique visitors, you can expand to look at repeat visitors. If your number of repeat visitors is growing, this means that people are visiting your site once and then deciding to come back again to shop or read. This means that your site was compelling and useful, or “sticky” in online marketing lingo. As you get a handle on your visitor numbers, your next question will be, “Where did these people come from?” The referrals report is the answer to that question. Referrals track users as they click on links in search engines, on other blogs, and other websites to your web site. The referrals report will show the number of visitors you are getting from social sites as well. Understanding where you traffic is coming from is the key to understanding how the work you are doing to promote your business is working. Are people mentioning you on their blogs and linking back to you? Are your social efforts paying off? The referrals report is also useful to find other companies or blogs that you might consider forging a stronger relationship with. If you are getting traffic from a specific site, you might want to consider reaching out to that site and establishing a more formal relationship. A “bounce” is when someone visits your site and immediately clicks the back button or closes their browser tab. What this usually means is that that user didn’t find what they were looking for on your site and decided to leave. This is the equivalent of someone walking in the front door of a store, taking a quick look around, and immediately walking back out the door. Obviously, sometimes people just end up on the wrong site by accident, so getting your bounce rate down to zero is impossible. But reducing the rate is critical. Every lost visitor is a lost opportunity, so you’ll want to figure out why people are leaving and try to add the right content or navigation on your site to keep users around. If you combine the referral report with your bounce rate data (Google Analytics does this for you) you should be able to see what sites are generating the highest bounce rate. Unfortunately, Google is no longer sharing search term data, so you don’t get to see what search terms have a high bounce rate. People often confuse “bounce” and “exit,” but they are very different metrics for you to measure. Unlike a “bounce”, when a user visits your site and barely views one page, an “exit” is when a user visits multiple pages and then leaves your site. Some pages on your site may naturally have a high exit rate, such as your order receipt page. After all, a visitor is probably done with their purchase if they have reached the order receipt page after successfully completing a purchase. However, having a high exit rate on other pages on your site may indicate that you have some problems. Take a look at your pages that have high exit rates and try and hypothesise why a higher number of people than average are leaving your site from that page. Are they not finding the information they need? Why are they choosing to leave? Of all the metrics you might track, conversion rate is probably one of the most important. Conversion rate is the percentage of people who achieved a goal on your site. Goals are things like completing a purchase, filling out a contact form, or viewing a certain page on your site. The reason conversion rate is so important is that it is the ultimate measure of how successful your site is. If your site has a low conversion rate, you are either attracting the wrong kind of visitor to your site or your site is not effective at convincing your visitors that you offer the right solution to their problem. Monitoring conversion rate can also tell you if something is broken on your site. For example, if your conversion rate suddenly drops, that might mean that there is an error in your shopping cart or a problem with your sign-up form. Finally, it’s important to know what pages your visitors think are the most important on your site. By viewing your top ten pages report, you know which pages to focus on as you look to improve your site and which pages will have the most impact if you make changes. If you run a content site, your top ten pages report may change frequently. In this case, the report will tell you what types of content your visitors find most useful and engaging, and which headlines you’ve written were the most successful. Use this knowledge to help determine what kind of content to create as you move forward with growing your site. Web analytics and metrics can be overwhelming. The key to avoid drowning in the sea of numbers is to start small. Pick a metric that matters to you and your business and track that one metric and try to improve it. By focusing on only one thing as you get started, you’ll get a better feel for the numbers and how you can impact them. As you get comfortable, you can expand the metrics that you track. For much more detail and help with web metrics, I highly recommend Avinash Kaushik’s books: Web Analytics: An Hour a Day and Web Analytics 2.0. 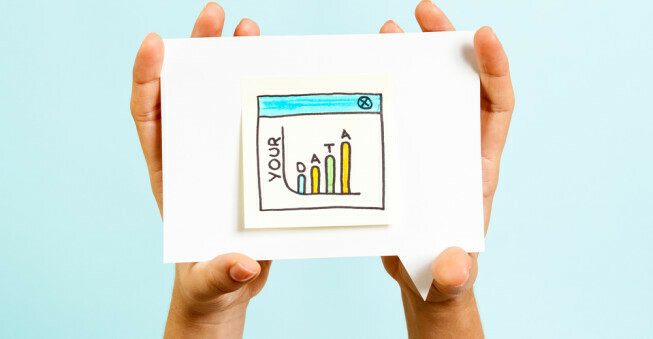 What web metrics do you track in your business? Let me know in the comments. This post is a part of Small Business Tracking Week, sponsored by LivePlan and TSheets. Want to Grow? Know Your Numbers. Track Your Metrics. How Do I Improve My Website Conversion Rate?